UZ (Ukrainian Railways) boxcar #0021, type R9494 #52526654 empty and loaded explosive materials. When staged in a car loaded with explosive materials, a cover from locomotive, wagon with people and the tail of the train at least three carriages, one car from the wagons laden timber and pipes, and other goods that go beyond the end beams and conveyors. It is forbidden to put in laden loads of class 1BM with wagons poisonous substances, compressed and liquefied gases, lightly flammable liquids, dual trains, trains, which obzdzhivaet machinist in one person, increased length, loaded oversized cargo of the lower 3 degrees and above, lateral 4 degrees and higher, more than 3 degrees oversize. 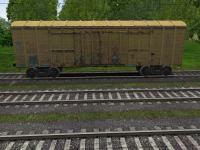 Wagon adapted to the Open Rails and Russian Train Simulator.